Which Wedding Bouquet Style is your Favourite? Start your search with bridal bouquet pictures for inspiration and endless design possibilities, these are some of my personal favourites. 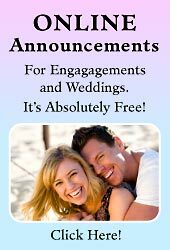 If you are unsure of your choice in bridal bouquet styles, have a look at our bridal bouquet ideas and pictures, there are lot of bouquet pictures in whites, yellows, blues, pinks, reds and other floral arrangements to help in your decision making. The posy is round and small and can easily be held in one hand. There are two styles of posy bouquets, one can be loose, hand tied and unstructured, the other formal and wired, the stems of the flowers are removed and replaced with florists wire, constructed into a much lighter posy with and easy to hold handle. More pictures of Posie Bouquets. Traditionally the nosegay was a small round shaped bunch of flowers and herbs, often containing more greenery than other bouquets and mounted in a tussie-mussie (a small, Victorian style, metal or glass, cone-shaped holder). It came back in fashion in the 1980's as a tight posy of small flowers with a stiff tulle backing. It was very popular with flowergirls and bridesmaids. In modern times it has been revived and reinvented with additions of lovely satin and organza ribbons and larger floral arrangements. The tussy mussy first appeared in France during the eighteenth century. A nosegay bouquet in a small metal hand-held vase. Some have attached ring chains for easy carrying. They were used primarily during the Victorian Era and considered art forms as each one was unique. The vase or cone could be made from pewter, cobalt glass, silver, gold, porcelain, plastic and even beaded. You have the option of tying lace and ribbons to the tussy mussy to dress it up. Today, the tussy mussy elegantly displays the bouquets on your reception table during the wedding festivities, and then serves as a lovely keepsake for the bride and bridesmaids. More pictures of tussy mussies. The biedermeier bouquet is European-influenced. The blooms are tightly-structured and carefully-arranged in defined circular patterns of different coloured flowers, each ring containing one type of flower. Originating in Switzerland in the late 1800's, often orange and lemon peels were added for extra frangrance. A bouquet similar to the nosegay and named for a German style of interior design. The biedermeier has a very pleasing geometry and is recently showing signs of popularity again due to its dramatic beauty and contrast. The arm sheaf bouquet first became popular in the early 1900's under the name of Bernhardt bouquets; inspired by the presentation bouquets given to the actress of the day, Sarah Bernhardt. 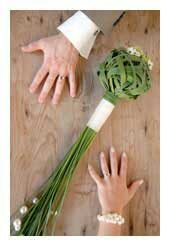 They are long stemmed flowers and foliages that the bride carries cradled in her arm, also known as a presentation bouquet. It is a stunning alternative to more traditional styles of bouquets, it is very chic, and best suited to modern style weddings. Tastefully designed to be cradled in the bride's arm and can be as simple or as elaborate as she likes. They can be single-ended, with stems showing at one end, or double-ended with no stems showing. A gorgeous ribbon provides the finishing touch. 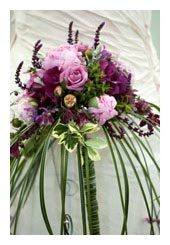 Popular floral choices for arm bouquets are calla lilies, gladiolus, orchids, long-stemmed roses, delphiniums, and larkspur. The fan bouquet, is a simple bouquet of flowers attached to a lacy plastic fan. Popular in the late eighties, they were embellished with carnations, baby's breath and plenty of ribbon. This style of bouquet is reminiscent of the Victorian Era, and is popular for old-fashioned, vintage style or Asian-inspired weddings. 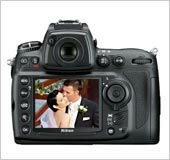 Perfect for brides who want something a little different. The crescent bouquet appears in the shape of a quarter moon, a soft arch, using distinguished flowers with definite shapes, often orchids, wired together to form a slender handle that you can hold in one hand. 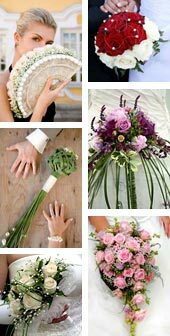 These bouquets are true floral art and an individualist representation of the bride's personality. This style is perfect for sophisticated and contemporary weddings. 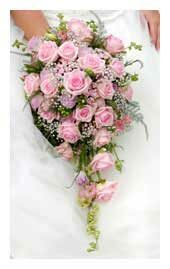 Flowers are usually tapered and extended at each end while the center is more compact. 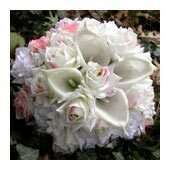 It can be symmetrical or not, the left and right side of the bouquet is seen flowing down and has only one trailing stem. 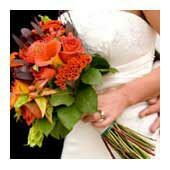 This style of bouquet is best carried below the waist to show off its unique beauty. The Muff bouquet was very popular in Europe and was created in the early centuries and borne out of neccessity. 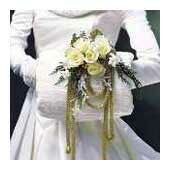 In mid winter, the bride's hands would sit into the muff, a lovely corsage-shaped bouquet attached at the front. Unusual and unique, a perfect choice for a winter wedding. This bouquet is lovely with long evening gloves. 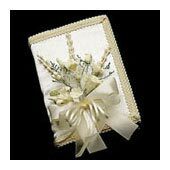 The prayerbook bouquet is a small prayer book or bible used as the platform upon which a small bouquet is placed. The design may be a small cluster of flowers the size of a corsage which is placed on top of the prayer book and can be attached with ribbons or a small armature to prevent damage to the book. Another way of carrying a prayer book is to place a single flower stem through the center of the book. 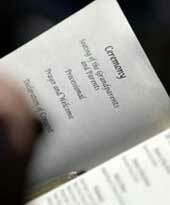 The prayerbook or Bible spray bouquet is a sign of faith and spirit. A long-time favourite of devout brides. While a traditional choice, it can be designed in a contemporary way. The cascading bouquets were originally referred to as shower bouquets. Also known as a teardrop bouquet or trail bouquet. These replaced the fashion of posies around the time of 1910. This style became exaggerated by 1920, with much larger bouquets, so large they almost concealed the bride. They reached their peak from 1920 - 1930's until WWII. 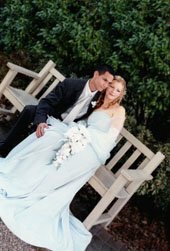 The Cascading bouquet, which is the most formal and most traditional of bouquets, is designed to spill gracefully over the bride's hands as it flows downward for a sophisticated and stylized look, almost any flower can be used in this style. The bouquet is roundish at the top but pointy at the bottom. 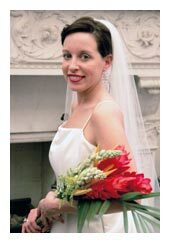 The traditional shower bouquet is known as the large multi-trail bouquet, subsequently renamed the princess in honour of the late Princess Diana and her impressive bridal bouquet. 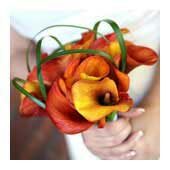 The modern smaller version is called the teardrop bouquet or trail bouquet. The pomander bouquet is also known as a kissing ball. A pomander is a ball of flowers suspended from a loop of decorative ribbon. 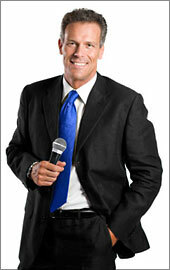 Adult attendants can carry pomanders, but young attendants such as flower girls and junior bridesmaids most often carry them. More pictures of floral pomander balls. Learn how to make a pomander bouquet in 20 minutes. The hand-tied bouquet is a loose-tied arrangement. These hand tied styles are also referred to as clutch bouquets. 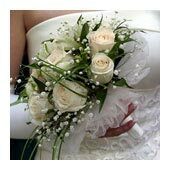 This type of bouquet consists of a simple gathering of flowers, bound and tied with ribbon with stems left exposed. Queen Anne's lace, phlox and cosmos are magnificent examples of this style. This is a beautiful choice for an outdoor wedding with that just picked from the garden look. It is arranged in a looser manner with the stems left longer and a large ribbon or exotic fabric tied together. A wrist bouquet or flower bracelet is a small flower bouquet worn on the wrist. More corsage than bouquet, this style is comprised of a small floral arrangement. Flowers and foliage are mounted on a small base attached to a strong elastic bracelet fitted around the wrist. A great alternative to a traditional bouquet. Worn by brides and bridesmaids who want the look of a bouquet, but want the freedom of having their hands free. 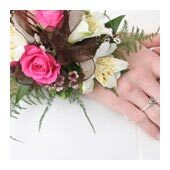 The wrist corsage can be made in any combination of flowers and is occasionally complimented with ribbons and beads. The ballerina bouquet, is a round bouquet composed of masses of tulle or net and few flowers. This type of bouquet was popular in the early 1940s when flowers were scarce due to World War II. For modern brides, a ballerina bouquet offers a cost-effective, yet beautiful solution for a tight floral budget. 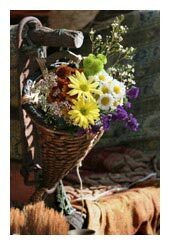 The basket bouquet has flowers arranged in a beautifully shaped shallow basket and is usually and more often used in a garden or garden-like wedding setting. 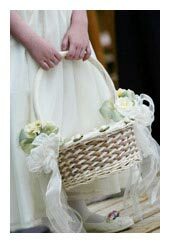 The basket bouquet may be carried by the bride, but are most popular with and often carried by flower girls and junior bridesmaids. The small basket keeps their little hands occupied and out of mischief. 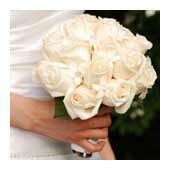 The scepter bouquet gives a dramatic accent to your wedding day, it takes the shape of an over-sized wand. The handles are extra long, entwined with ribbon, cording, ornaments etc. 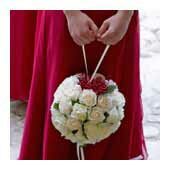 The scepter bouquets are suitable for any wedding occasion and may be carried by any member of the wedding party. The cone bouquet, as the name implies, forms a cone shape. This style bouquet works best for bridesmaids and flower girls. Depending upon the flowers and foliage selected, this bouquet will compliment any casual or formal event. Too make it easy for you to design your bouquet, here's over 100 flower meanings, a flower dictionary with corresponding flower pictures, it's a great way to pick your flowers, especially if you don't know much about them. 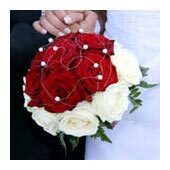 Flower meanings can add an emotional or spiritual dimension to your choice in bouquets and floral arrangements, along with birth flower meanings. Flowers come in many different colours and shades, our flower guide informs you of the flowers that are in season and the colours they are available in. The types of bouquet arrangements you finally choose, depends on your wedding theme, your bridal colour scheme and the simplicity or extravagance of your bridal gown. A little on History: Queen Victoria's posy bouquet was established as one of the most popular bouquet designs. In the 20th century, the simplicity of the posy was superceded by more elaborate bouquets that contained many different flowers adorned with ribbons, bows and other accessories, some so extravagant that they would almost touch the floor. Until recently in the last few decades the posy has slowly made a comeback.